Over the years I have tried several different recipes for baked doughnuts and never found one with amazing results. This recipe (adapted from Sally’s Baking Addiction) is by far my favorite. Perfectly moist and will definitely satisfy your craving. These chocolate dipped baked doughnuts are also extremely easy to make. It takes about as much effort as it does to make pancakes. 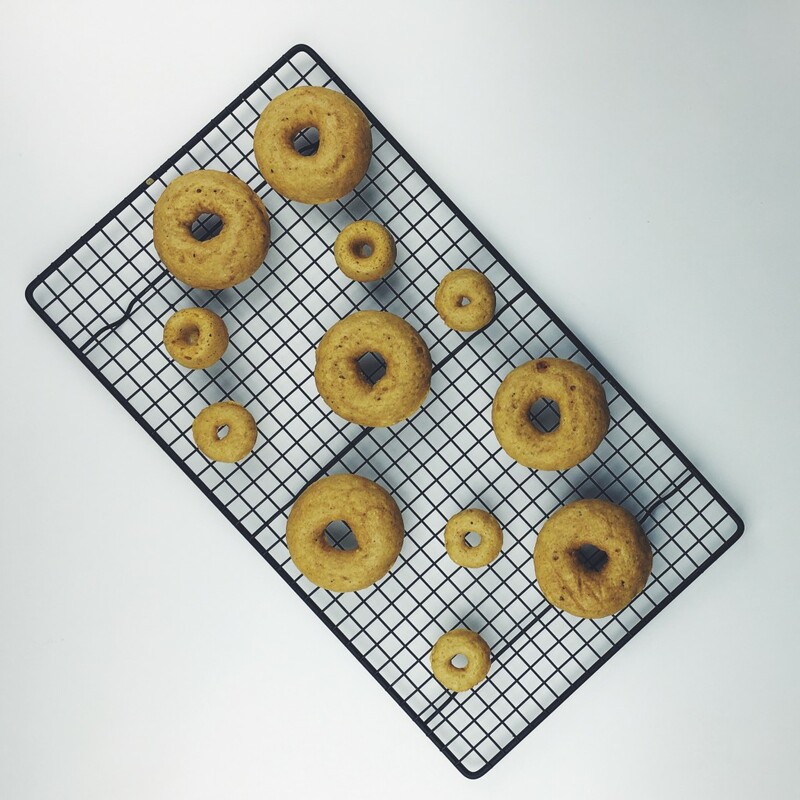 The only special equipment you need is a doughnuts pan. I also found a mini donut pan. Just be careful with the mini doughnuts, they are dangerous. This recipe is great for different types of doughnuts, you don’t have to go with chocolate. Feel free to toss them in cinnamon sugar, icing sugar, or cover them in sprinkles. They also taste great plain and dipped in coffee. I wouldn’t say these donuts are healthy, but I feel a lot less guilty stuffing these down than I do when eating fried donuts. Preheat oven to 350°F and spray doughnut pan with cooking spray. In a large bowl, combine flour, baking powder, baking soda, salt, cinnamon, and nutmeg. Whisk together well. In a separate bowl, whisk together the egg, brown sugar, buttermilk, vanilla, and melted butter. Pour the wet ingredients and whisk until combined. Like pancake batter, you don’t want to over mix. Don’t worry if the batter is very thick, it is supposed to be. Spoon the batter into the doughnut pan. You’ll want to fill each one about 3/4 of the way. It is a little tricky to cleanly spoon in so you can use a piping bag (or ziplock bag with the end cut off) to easily squeeze the batter into the pan. Bake for about 10 minutes or until the doughnuts are lightly browned. Allow them to cool for 2 minutes and then move to wire rack to fully cool. Repeat step 3 and 4 with leftover batter. To make the chocolate ganache, place the chocolate chips in a heatproof bowl and bring the cream to a boil in a small saucepan. Pour the heated cream over the chocolate and stir until melted. Add the butter and stir until smooth. 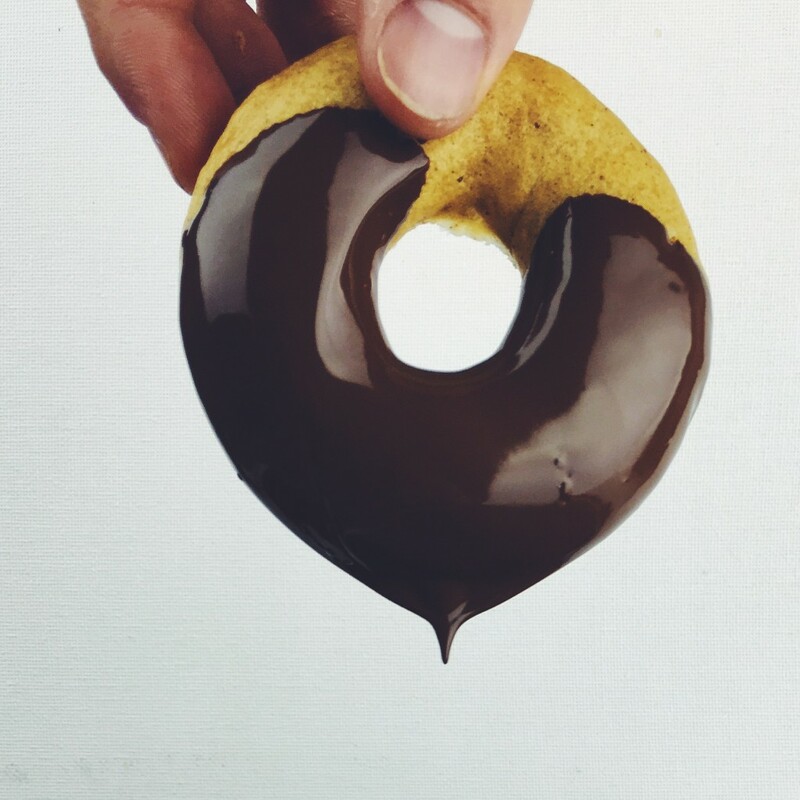 One by one, dip the doughnuts into the chocolate top side down. You can also dip them as they are in the picture, they just might be a little messier to eat.